"In my opinion, watercolour is underestimated" – said Alexandra, – "so I started to study it and remain devoted to it until present day. Painting on the wet sheet is a very complicated technique, that's why it interested me. And also the fact that very few people use it. So I decided to keep this technique for the descendants. It's just the manner of my paintings, which apparently expresses my character. The colours on my works are bright and even expressive. Many critics in France, while seeing the bright work, do not immediately realize that this is watercolour. Have you always dreamed of becoming an artist, or did it happen spontaneously? I've been drawing since I was a child, when I could hold a pencil. My dad was engaged in minting, and I grew up in his workshop. My father became my first teacher of drawing and my most severe critic. He never praised me and does not praise me still, he believes that a person should develop further on. And my mother worked as a nurse in the city hospital for more than 48 years. She loved her job, but a year ago, when our son Miroslav was born, she decided to quit her job to help me. And I'm grateful to my parents for supporting me in every possible way. When it came time to choose a profession, I decided to enter the art school, but in the 90s, creative professions were not in demand. So I entered the faculty of the international economy and simultaneously spent five years in the workshops of the Union of Saratov Artists, gaining experience among the professionals. My first exhibition abroad took place in 2000 in France. In those days, Russian seasons in France and French seasons in Russia were held under the exchange program for photographers and artists. The exhibition took place in a small town of Saint-Cloud near Bordeaux. I was the youngest participant there. When we installed the pictures, I saw that a woman was crying next to my landscape. It turned out that her great-grandmother was from Ukraine, and the landscape I painted reminded her of the homeland of her ancestors. I gave her this picture and then I realized that I should continue painting. In addition to painting, I also work as a fashion designer. I create dresses n the basis of my paintings. I already have "Peonies" and "Poppies" dresses, now a few more variants are under development. 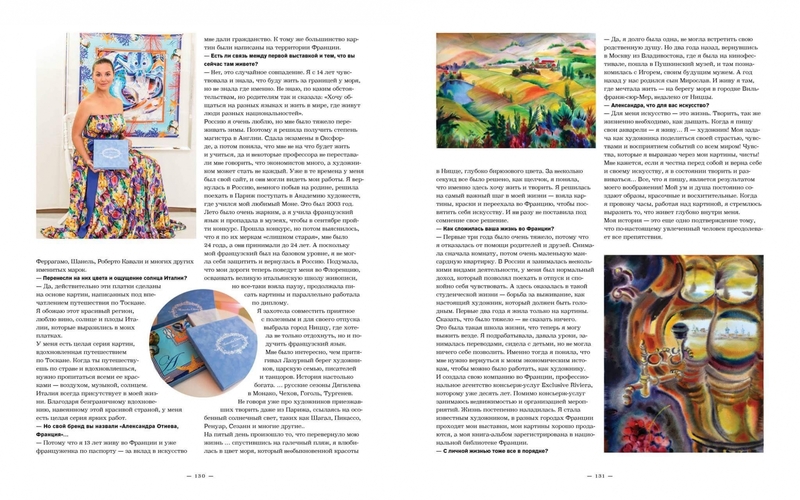 In August, we launched our brand "Alexandra Otieva, France" in Beaulieu-sur-Mer, and made an exclusive series of silk scarves, the design of which was also developed on the basis of my paintings. Scarves are made of natural silk with handmade overseaming. This is a luxury segment described by luxury packaging, a short description of the product inside it, a bag with silver handles. They are made in Italy at the same plant where Ferragamo, Hermes and Chanel make their scarves. These scarves are very bright. Did you transfer to them the colours and the feeling of the sun in Italy? Yes, indeed these scarves are made on the basis of paintings crated under the impression of travelling in Tuscany. I adore this region, I adore wine, sun and fruits of Italy, and I expressed in my scarves. I have a whole series of paintings inspired by the journey in Tuscany. When you travel around the country and feel inspired, you need to soak in all its colours – air, music, sun. Italy is always present in my life. Because I have lived in France for 13 years and already a Frenchwoman according to the passport – I was given citizenship for my contribution to art. In addition, all my pictures were painted on the territory of France. Is there a connection between the first exhibition and the fact that you live there now? No, it's a coincidence. I never had a desire to live in France, but from the age of 14 I knew that I would live abroad by the sea. I do not know why, but I told to my parents: "I want to communicate in different languages ​​and live in a world where people of different nationalities live." I really love Russia, but it was hard for me to survive the winters. So I decided to get a master's degree in England. I passed the exams in Oxford, and then realized that I will have nothing for life and studies. I returned to Russia, lived there a little, and then decided to go to Paris to enter the Academy of Arts. This was in 2003. The summer was very hot, and I sat and taught French to take part in the competition in September. I passed the competition, but later it turned out that I was "too old" by its standards, I was 24 years old, and they accepted only persons up to 24 years. And since my French was at a basic level, I could not protect myself and returned to Russia. I thought that my roads now take me to Florence, but still took a pause, continued to create pictures and simultaneously worked on the diploma. Then I decided to go there, where the Russian tsars had their vacations, and find out why the Cote d'Azur always attracted artists. I took a vacation and went to Nice, deciding to learn the language at the same time. Arriving there, and seeing the turquoise sea exactly on the 5th day, I realized that I wanted to live here. I took a course of French language and returned home to arrange my immigration. After passing all the formalities, I received a student visa, resigned from work and returned to Nice. How was your life in France? The first three years were very difficult, because I refused to receive any help from my parents and friends. First I lodged in a room, then in a very small attic apartment. In Russia, I was engaged in several activities, I had a normal income, which allowed me to go on vacation and feel calm. And here I was in such a student-like life – the struggle for survival, as a real artist, who must be hungry. I had to deal not only with pictures, but much more than that. To say that it was hard is understatement. It was such a school of life that now I can survive everywhere. It was then that I realized that I needed to return to my economic roots so that I could work as an artist. And I established in Russia the professional concierge services agency Exclusive Riviera, which is already ten years old. In addition, I was engaged in translations. And life gradually improved. I became a famous artist, my exhibitions are hold in different cities of France, my pictures are sold quite well. Is your personal life all right? Yes. Two years ago, when I returned to Moscow from Vladivostok where I visited film festival, I went to the Pushkin Museum and there I met Igor, my future husband, and a year ago our son Miroslav was born. And I live in the place I dreamed of – on the beach in the town of Villefranche-sur-Mer, near Nice. Alexandra, what is art for you? For me, art is life. Painting for me is just as vital as breathing. When I create my watercolours – I live ... I am an artist! My task as an artist is to share my passion, feelings and perception of events with the whole world! Feelings that I express through my pictures are pure! I think if I am honest with myself and devoted to myself and my art, then I'm able to create and develop further... Everything I create is the result of my imagination! My mind and soul are constantly creating images, so colourful and delicious. When I spend hours working on a picture, I try to express what lives deep inside me.